It does get stale after a while, simply because there is only so much you can do with hurtling through the air. 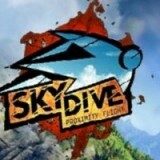 To put it simply, Skydive: Proximity Flight is a heck of a lot more fun than I thought it could be. 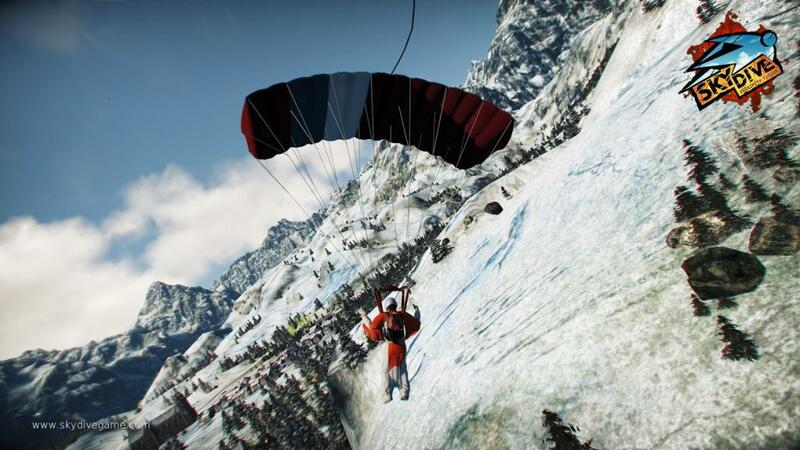 How do you make skydiving into a reasonably entertaining video game? You give the players the whole package – simple controls, realistic scenery, and the motivation to keep on jumping. If the thought of jumping off a cliff into the wide open air and feeling gravity’s relentless weight pulling you as you go hurtling towards the ground sounds like your idea of a darned good time, then do I ever have the game for you! Skydive: Proximity Flight takes base jumping to your console as you skydive and barrel roll around your living room. The concept is exactly what it sounds like – you skydive, flying through the air, and then (hopefully) deploy your parachute in time to stick a nice, gentle landing. How do you make a video game out of that? I wondered that myself, but I’m happy to report it’s actually been done pretty well. 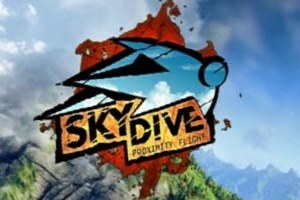 The game consists of a series of challenges and races, as well as a freestyle mode, all of which allow you to get a pretty well rounded skydiving experience from the comfort of your living room. The controls are super simple to catch on to. By default, you’ll be using the sixaxis on your controller to guide your little skydiver through pinhole tunnels, skim over trees, and zoom perilously close to mountainsides. The right shoulder button gives you a hefty shot of adrenaline when your pace starts to slow down, and that’s pretty much it. 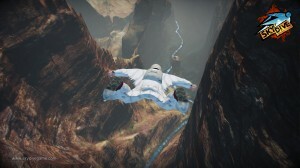 The simplicity of the controls serves well to keep the emphasis where it belongs – on the beautiful scenery, the complex maneuvers, and the thrill of screaming “BOOM!” when you accidentally “nick” the side of a mountain. The challenges are the meat and potatoes of the game, offering the bulk of play time. 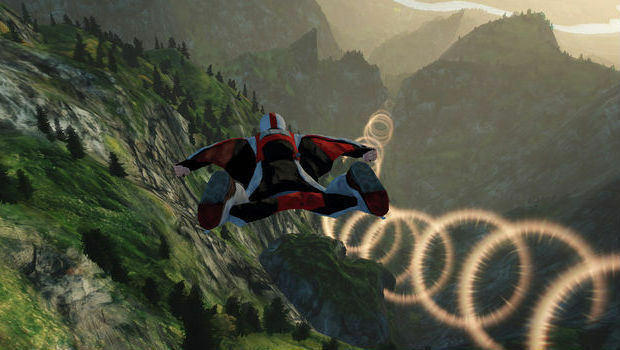 In each of these, you’ll be soaring through the air trying to capture a set number of special points without hurtling to your doom or ricocheting off the side of the mountain. If you do ricochet off the mountain, sometimes you’ll bounce and continue flying as if nothing happened (which I found to be both mildly disconcerting and infinitely hilarious), but most of the time you just die. The hurtling to your doom also results in defeat, as does failing to nab enough of those special points. The method of capturing special points brings to mind Starfox in a parachute. Each challenge has a kind of course to it, which is marked by golden rings at various intervals. Each ring that you fly through equals one special point. A running tally is kept at the top of the screen, so you’ll always know how close you are to success. You don’t have to hit every ring, but you can’t miss tons either. While it takes a few tries to get the hang of it, it’s actually quite good fun. In addition to collecting rings, there are trick challenges. These range from the basic dive or barrel roll, to the more complicated Dive and Spin or Pinhole. While the tricks have a number of their own challenges, they can be performed any time you’re diving, no matter which level. When you get tired of the challenges, you can check out the Adrenaline Races for a little friendly competition, or perfect your moves in Freestyle Mode. While there isn’t a while lot to these modes, they do add something in the way of variety, which is always a plus. There isn’t too much in the way of customization in Skydive: Proximity Flight, but you can change your character as often as you like, with choices ranging from popular names in base jumping to a wicked cool flying squirrel costume.